You don’t need to play Sea of Thieves for very long to realize this is a game not terribly bothered about following recent video game design conventions. I came to this realization when, after deciding with my crew to attempt a voyage, I learned that we had to locate our objective by looking at a picture of an island and identifying it on a larger map. There was no flashing indicator or big arrow telling us where to go, just our own ability to recognize the distinct shape of a bit of land, and figure out what direction we needed to go relative to our starting position to get there. Perhaps I should back up a bit. 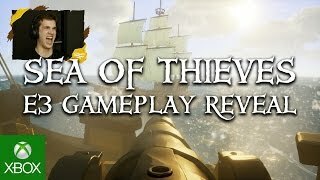 In case you haven’t been paying attention, Sea of Thieves is the new game from Rare, who haven’t released anything in some time. Sea of Thieves is a mutliplayer game about pirates that was announced years ago, but only recently has had the curtain lifted on the specifics of what the game will actually, well, be. Over the last few days, I had the chance to jump into the closed beta with some friends and spend enough time with it to get a sense of how the title should play once released. A typical play session will occur as follows. First, you must decide on a vessel to embark upon. You can choose to play with three other people on a larger ship, take a single friend for a duo adventure, or go at it alone on a smaller sloop. You and your crew will load into one of the several island outposts on the open, ocean-dominated map, where you can drink grog, play music and purchase ‘voyages,’ scrolls that contain information on some hidden treasure by means of either a series of riddles or an image of the island with red X’s marking the spot. Each ship has a table with a map that shows the entire playable area, dotted with distinctive looking islands with unique names. To reach your destination, you must glean over the map looking for either the name of an island mentioned in a riddle, or one matching the island that appears on your treasure map. At this point, you can set a course and start sailing towards your objective. The sailing in Sea of Thieves is fantastically involved, especially when trying to sail a fully-crewed Galleon. First you must raise the anchor, a slow process that can be sped up if the entire crew helps out. After this, one player must take the helm while the others work on lowering the sails and setting their angle. In order to go at any reasonable speed, you must determine the direction of the wind and attempt to angle the sails such that they will be filled by it. These are big, heavy ships and they do not respond quickly to anything you do. There is a long delay when steering the Galleon between when you turn the wheel in a direction and the ship starts slowly, begrudgingly doing it. When you inevitably crash into some rocks, your hull becomes damaged and will start taking on water unless you repair it with wooden planks and then bail the water out with buckets. Upon arriving at your destination you will need to start looking for treasure. Sometimes this involves matching up X’s on your treasure map to the terrain, or following a series of Pirate riddles to unearth the goods. You might get attacked by a few pistol or sword-wielding skeletons along the way, though they never seemed like much of a threat as I was able to dispatch them with the game’s very simplistic sword or ranged combat. Once you have the treasure, you load it back onto your ship, sail back to an outpost and sell it for profit. Of course, there is one variable that you must be aware of when playing Sea of Thieves. 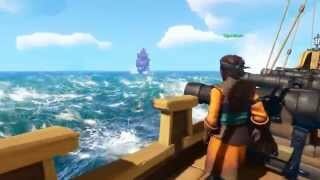 Your game world will be shared with other players, part of their own crews going on their own voyages. If you have found any treasure chests and are storing them on your ship, other players could attack and steal the treasure or even sink your ship. Inversely, you can steal chests from other ships. 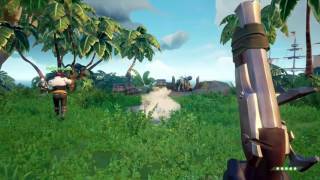 Sea of Thieves’ gameplay mechanics really come to life when you get into an encounter with a group of hostile players. Adjusting sails so that you can move and turn quickly can be essential to winning or escaping a fight. If you want to actually sink your opponent’s ship, you need to hit them at the water line with your cannons, which can be extremely challenging when both ships are moving through choppy seas. You can try and board each other’s vessels by sailing close, or you can fire yourself or crewmates out of the cannons. If you die, you will be sent to a mysterious ghost ship for a short period of time before respawning on your own ship. If you become stranded at sea, a mermaid will appear who will teleport you back. I can't get to the end of this preview without mentioning how good the game looks. The slightly cel-shaded visual style works surprisingly well with the Pirate theme, but the real star here is the ocean. The waves and water look incredibly convincing, changing with the wind, weather and time of day to create something truly dynamic and visually captivating. The game also seems to run extremely well, though some server issues exist that are hopefully ironed out before launch. This process of going on voyages, selling treasure and getting into periodical encounters with other crews appears to make up the foundation of Sea of Thieves. At this point, it seems there will be no character leveling, and progression will primarily be relegated to cosmetic upgrades and working your way through the voyages of each faction (there will be three in the final version compared to just one in the beta). What is here is certainly fun and refreshing, and probably a dream come true for anyone who enjoys role playing as a Pirate (and lets be real here, who doesn’t?). Whether this experience will have any real legs remains the big question. This will depend on how well the frequency of encounters with other players is balanced and the amount of variety found in the voyages. Sea of Thieves is scheduled to set sail on March 20th for Windows 10 and Xbox One.